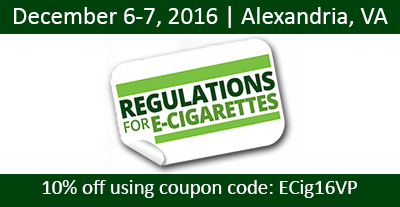 Regulations for E-Cigarettes - December 6-7 2016 | Alexandria, VA This is the only conference to bring together the testing, regulatory and industry leaders to address the science of regulatory compliance. This is the only conference to bring together the testing, regulatory and industry leaders to address the science of regulatory compliance. It will provide an independent and objective forum for key thought leaders from regulatory affairs, legal counsel, testing and CRO’s, big tobacco and e-cigarette companies to address and plan for the evolving regulatory landscape.